Oranges are low in calories and full of nutrients, they promote clear, healthy, skin and can help to lower our risk for many diseases as part of an overall healthy and varied diet. An orange has over 170 different phytochemicals and more than 60 flavonoids. Many of these have been shown to have anti-inflammatory properties and strong antioxidant effects. The nutrients in oranges offer a range of health benefits. One orange provides a range of vitamins and minerals; a staggering 130 percent of your vitamin C needs for the day. According to the American Heart Association (AHA), eating higher amounts of a compound found in citrus fruits like oranges and grapefruit may lower ischemic stroke risk for women. Those who ate the highest amounts of citrus had a 19 percent lower risk of ischemic stroke than women who consumed the least. According to the National Health and Nutrition Examination Survey (NHANES), fewer than 2 percent of US adults meet the daily 4700 mg recommendation. As an excellent source of the strong antioxidant vitamin C, oranges can also help combat the formation of free radicals known to cause cancer. One study has concluded that vitamin C from oranges could one day be harnessed to impair colorectal cancer cells, but 300-oranges worth of vitamin C would be needed. High fiber intakes from fruits and vegetables are associated with a lowered risk of colorectal cancer. However, in 2015, a study linked grapefruit and orange juice with a higher risk of skin cancer. Researchers found that people who consumed high amounts of whole grapefruit or orange juice were over a third more likely to develop melanoma, compared with those who consumed low amounts. The fiber, potassium, vitamin C and choline content in oranges all support heart health. An increase in potassium intake along with a decrease in sodium intake is the most important dietary change that a person can make to reduce their risk of cardiovascular disease, according to Dr. Mark Houston, an associate clinical professor of medicine at Vanderbilt Medical School and director of the Hypertension Institute at St. Thomas Hospital in Tennessee. The Dietary Guidelines for Americansrecommend 21-25 g/day for women and 30-38 g/day for men. One medium orange (approximately 154 grams) contains 80 calories, 0 grams of fat, 250 milligrams of potassium, 19 grams of carbohydrate (14 grams of sugar and 3 grams of dietary fiber) as well as 1 gram of protein. One orange provides 130 percent of your vitamin C needs for the day, 2 percent of vitamin A needs, 6 percent of calcium and 0 percent of iron. 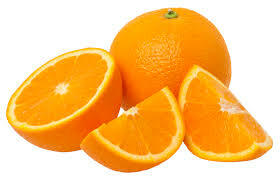 Oranges also contain thiamin, riboflavin, niacin, vitamin B-6, folate, pantothenic acid, phosphorus, magnesium, manganese, selenium and copper. Because of their high vitamin C content (over twice the daily need) oranges are associated with boosting the immune system.